What is peace? 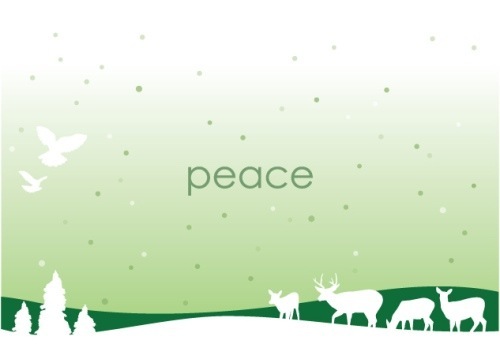 Why do we wish each other peace during the holiday season & during the rest of the year it becomes a non-existent rarely used phrase? According to Merriam-Webster it means 1. a state of traquility or quiet; a freedom from civil disturbance; a state of security or order within a community provided for by custom. 2.Harmony in personal relations. 3. Freedom from diquieting or oppressive thoughts or emotions. 4. A state or period of mutual concord between governments; a pact or agreement to end end hostilities between those who have been at war or in a state of enmity. 5. Used interjectionally to ask for silence or calm or as a greeting or farewell. While I’m sure these definitions are all lined with good intentions the question still goes unanswered; why can’t we have and pass these feelings on to the next person in a genuine manner year round? I love the Christmas season because I have two small boys who still believe in Santa Claus. I’m not big on all the gift giving because that seems a bit contrived but to see their sleepy faces on Christmas morning makes it worth it. My absolute favorite part of the entire season is leaving cookies & milk for Santa & carrots for the reindeer on the fireplace & having to take bites out of the food & leaving a thank you note from Santa. I’m not sure why but it brings tears to my eyes. I know that there is peace in my household on Christmas morning because I can feel it and I wish that I could have that feeling where ever I go each and every day of the year. Wouldn’t the world be a better place? I think so. I would like to take this opportunity to wish peace to all in their lives both during the holiday season & the rest of the year. I especially wish our troops who are away from their famililies peace & I pray that they come home safely.